SundWash systems can save operators hundreds-of-thousands of gallons of water in a single day, which more than pays for the system in the first year of operation. Sundyne, a global leader in the design and manufacture of pumps and compressors, today announced the SundWASH high pressure wash-down systems for the food & beverage industries. These newly-designed systems will be on display at the International Production & Processing Expo (IPPE) in Atlanta on February 12-14, in booth Number 8372. SundWASH high-pressure wash-down packages are specifically designed for facilities that process chicken, beef & pork, and beer & wine. In North America, there are more than 800 food & beverage processing facilities that require high pressure wash-down capabilities for cleaning & sanitation, odor control, dust suppression, deboning & scale removal, and for a wide range of other processing applications. Most processing plants utilize a central, high-pressure cleaning system that allows multiple operators to clean at the same time. For wash-down applications, high pressure is the key to efficiency, because the ability to boost pressure on demand enables operators to get the job done with less water and fewer chemicals, which saves money. SundWASH systems are comprehensive, turnkey packages that are available in single or dual pump configurations. They include motors, motor starters, a Pre-Programed Logic Controller (PLC), flow meters, flow & recirculation control valves, temperature switches, and piping that is available in carbon steel or stainless steel. The modular layout makes it easy to add wash-down packages in parallel to accommodate plant growth. Water demands at food & beverage plants can change drastically during an 8 hour shift. Single pumps cannot meet this demand – but SundWASH parallel pump systems scale-as-needed without compromising on performance. Boosting pressure increases efficiency, which enables operators to get the job done with less water and fewer chemicals. SundWash high pressure systems can save operators hundreds-of-thousands of gallons of water in a single day, which more than pays for the system in the first year of operation. SundWASH systems feature a small footprint. The Sunflo pumps powering these systems feature a cartridge assembly that can be easily swapped out in place, in a matter of minutes, without having to disconnect the pump from pipe connections. No additional alignments are necessary, which renders repair time to less than 60 minutes. The industrial grade Sunflo pumps powering the SundWASH systems feature field-proven high-pressure impeller technology that is optimized to deliver high head. Each member of the Sunflo family is optimized to provide a range of flow rates (from 4 GPM to 500 GPM), and head (from 100 feet to 5,200 feet). Recent enhancements to the Sunflo line of pumps include: new seal housings; a new labyrinth gearbox seal; splined impellers; new sleeves & O-rings; and improved bearings that improve performance and help the pumps resist upset conditions. Each of these enhancements help to ensure that high-pressure water is always available with continuous, stable flow. To learn more about SundWASH systems, visit Sundyne at IPPE in Atlanta, February 12-14, in booth Number 8372. Additional information is also available online at: http://www.sundyne.com. Headquartered in Arvada, Colorado, Sundyne is a leading manufacturer of highly reliable and efficient centrifugal pumps and compressors for use in oil and gas production, refining, chemical, petro-chemical, power generation and water processing industries. Sundyne is the world leader in delivering low-flow, high-head integrally geared centrifugal pumps and compressors; as well as safe and efficient sealless magnetic drive pumps. Sundyne pumps and compressors meet stringent API and ISO standards. 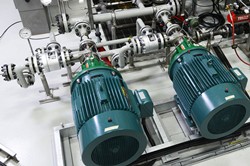 To learn more about the Sundyne family of precision engineered pumps and compressors, please visit http://www.sundyne.com. Sundyne is owned and operated by Accudyne Industries. Accudyne Industries is a global provider of precision-engineered flow control and compressor systems responsible for powering the world’s most economically vital industries. These process-critical machines deliver unflagging performance in incredibly demanding environments, giving confidence to the mission of their customers. Today, Accudyne is powered by more than 2,800 employees at 13 manufacturing facilities. For more information, visit http://www.accudyneindustries.com.